This is someone else who quickly became a good friend that I met early in 2008. His name is Gene Hartung. Gene lives right across the Buffalo Bill Dam from us in Cody, Wyoming. My wife, Leigh ran into him in downtown Cody. Leigh knows exactly the kind of faces I am constantly on the lookout for. She immediately asked him if he would pose for me. He told her how my mentor, James Bama, had asked him that very same question several years earlier. Gene agreed to pose for Bama, but what a shame that Bama never painted him! His loss was my gain. During a driving snow storm in 2008, we did my photo shoot at his log home. I actually posed him in the exact same clothes Bama did, except for a different shirt. Gene had a favorite saddle as a young cowboy. It had completely worn out and was long gone by then. 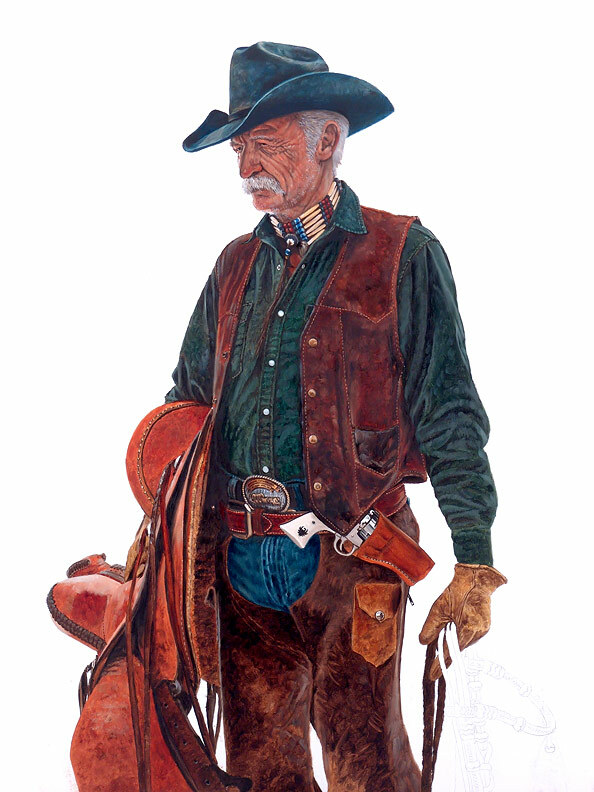 Since the Bama shoot, Gene had taken up saddle making. 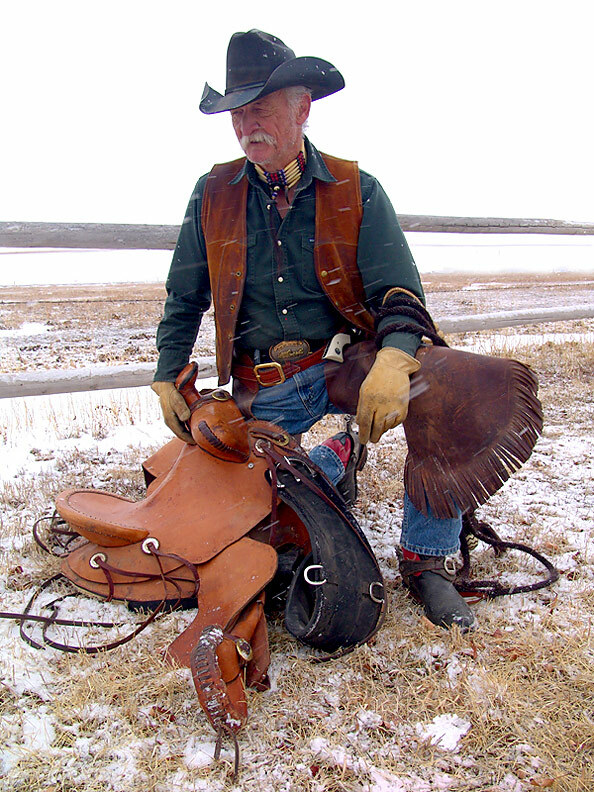 He wanted to make an exact copy of his own saddle, and that he set out to do. He had never made a saddle before. Working totally from memory, he actually made four saddles until he was happy with the forth one. 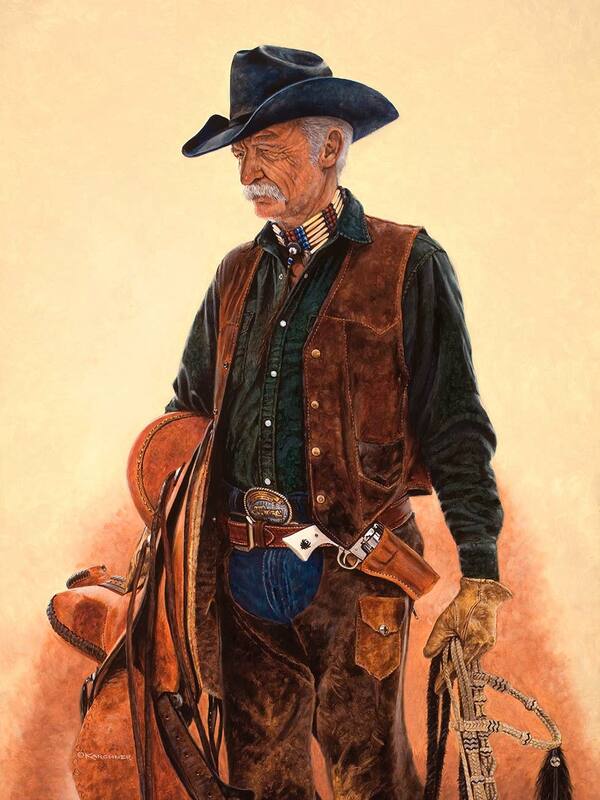 He sold the other three saddles, one actually went to a buyer in England. He was so proud of his saddle. I had to pose him with it. What a thing of beauty!! Here is one of my other photographs of Gene. As you can see, the wind was blowing hard and it was sure putting down the snow. This is day one of my painting. It is a traditional oil painting on 1/8″ thick museum-grade Masonite board. The Masonite is gesso-covered board called Gessobord made by Ampersand. The overall size of this painting is 18″ x 24″. Here I applied the base coats on Gene’s face, bone necklace and his Stetson. A little side note on Gene’s black Stetson, anyone that knows the Stetson brand cowboy hats knows that they have a grade. It is rated in Xs. 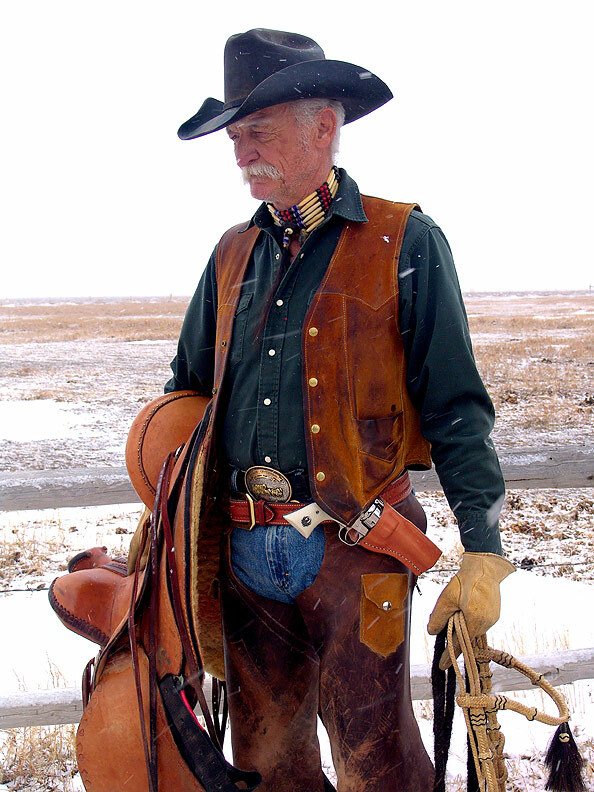 Most Stetsons you see for sale are usually in the 2X, 3X range which cost around $150-$300 and are made from tanned beaver hide. Years before, Gene, who used to raise wolves, traded for this 6X Stetson for one of his wolf pups! This grand old Stetson is worth $700! This is the second day’s work. I have Gene’s face, bone necklace and Stetson pretty much detailed. There will be a little more detailing on his face once it dries. I also managed to get his leather vest and shirt roughed in. On this day’s work, Gene and his wife, Flo, stopped by for their first look. They loved what they saw. It means a lot when you receive great feedback from your subject! Shown here, I detailed his vest and shirt. 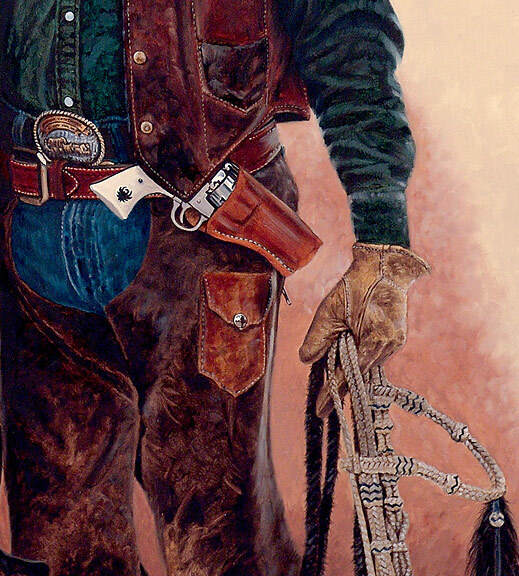 I roughed in his gun belt and his beautiful belt buckle. 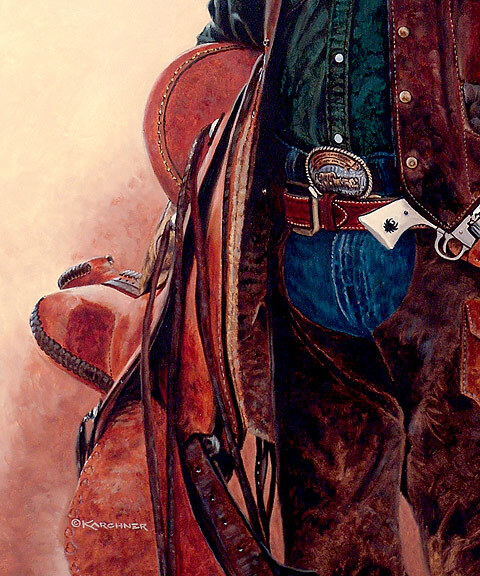 The belt buckle had fantastic details to reproduce! It is a Wyoming Centennial belt buckle and very collectible. It is a little hard to see but it has a beautiful covered wagon on it. It is trimmed in gold, silver and copper. You can also see I started roughing in Gene’s saddle. 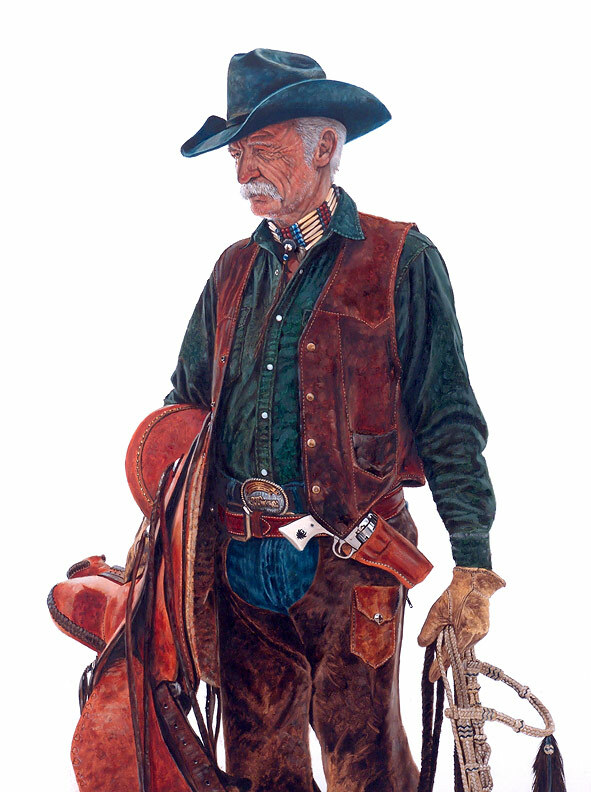 The next areas of interest to complete will be to finish his saddle along with his chaps, jeans and his stainless Ruger Vaqero Colt .45. In this version, I realized my own image was in this painting. 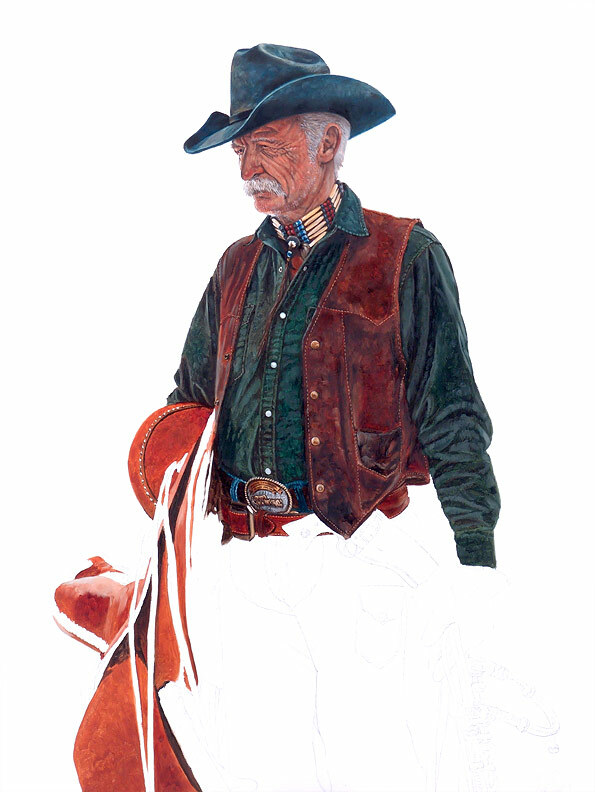 As I was painting the big, chrome snap on Gene’s chaps pocket I noticed that I was clearly reflected there taking his photograph. It’s funny, I just paint what I see! You might be able to see it in one of the close-ups below. I pretty much finished what I had anticipated, plus his left gloved hand. I wanted do add something here that I usually don’t do with my other work-in-progresses. I always post my WIPs on a large art site I belong to as I am actually creating these painting. They have an art discussion board where many other artists come in and leave comments and ask me questions as I paint. I have a dear fellow artist who drops by occasionally to comment. His name is Jerrie Glasper from Jackson, Mississippi. This day he had a few excellent questions that I took the time to answer. Maybe it will shed some light on the hows and whys of what I do. 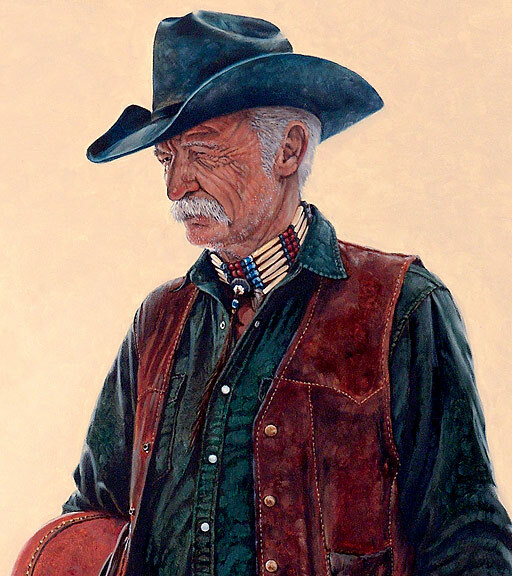 To explain the negative/positive thing, I consider myself a portrait artist first and foremost and most of my work just happens to be of the “western” flare, so my subjects are “the” main focus. I do paint intricate backgrounds from time to time, not often. 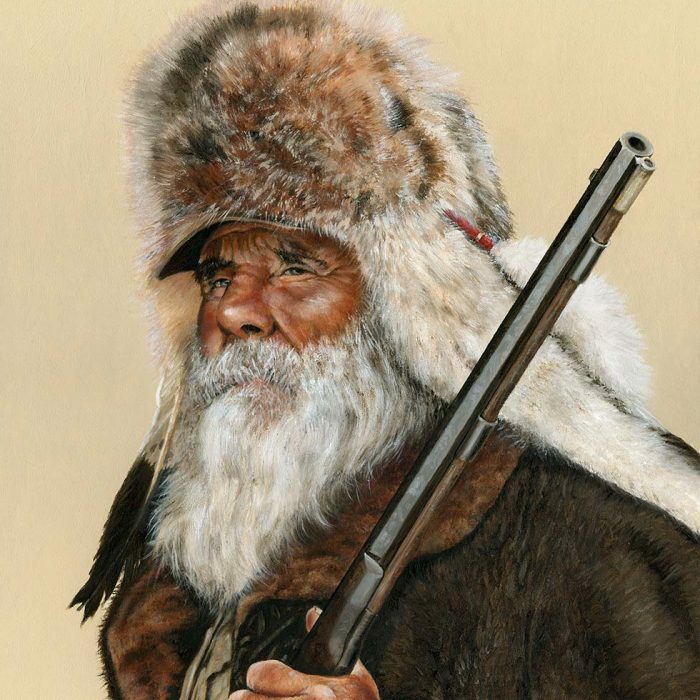 My last painting of The Mountain Man of Castle Rock is one of the few exceptions, but I still try to make my subject the reason for the painting. 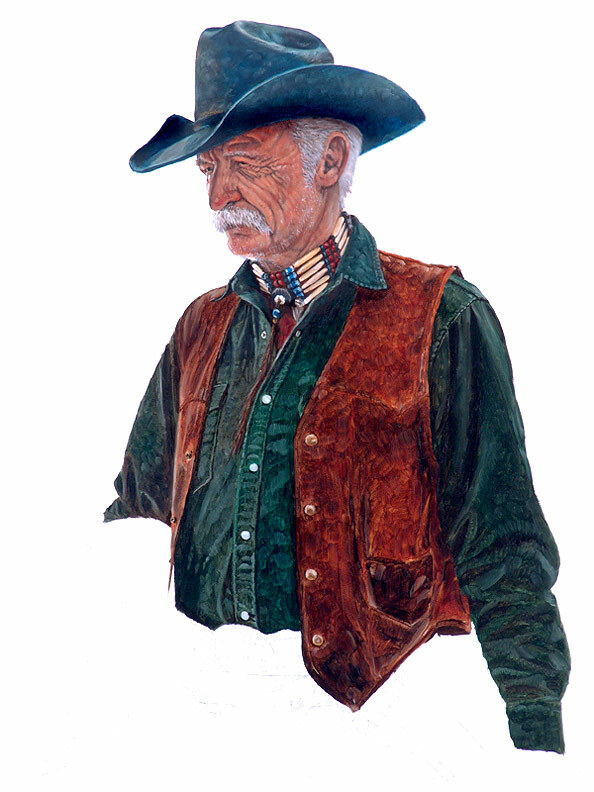 I am a true disciple of the famous western portrait artist, James Bama. 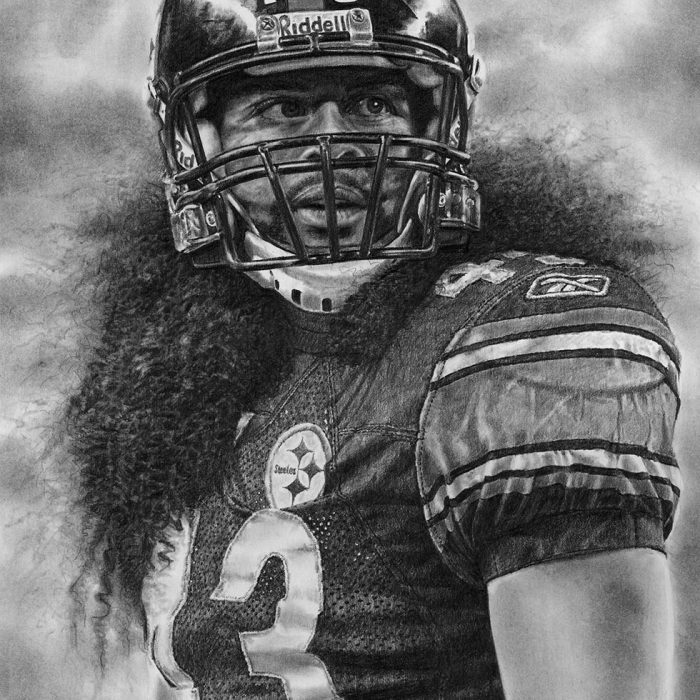 Bama does the same thing in most all of his portraits, not all, but most. We both try to immortalize the faces of the western locals for history’s sake. Many, many of Bama’s subject are no longer living. So many of these great people need to be recorded for history. Each and every one is a special person to me and to many others in the great community of Cody, Wyoming. There is no rhyme or reason to the question of why I painted Gene from the knees up. I try to mix up my portraits. Head, half body, full body, it doesn’t matter what I do, I just want a good mix to my portraits. Of course, painting a head shot is a lot easier for me than painting the full body, plus there is the time factor. It always takes me a lot longer to produce a full figure. BTW, everyone asks me how long to do a painting. It usually takes in the neighborhood of fifty to sometimes over one hundred hours to complete. Watching the hours is probably the graphic artist in me. I like to know about what I make an hour when I paint. It usually averages at $100 an hour. Good? Bad? I don’t know, as far as the “fine art world” is concerned, I would think this about average for someone like me… unless you are Picasso! LOL! I am definitely not a Picasso or a Jim Bama! 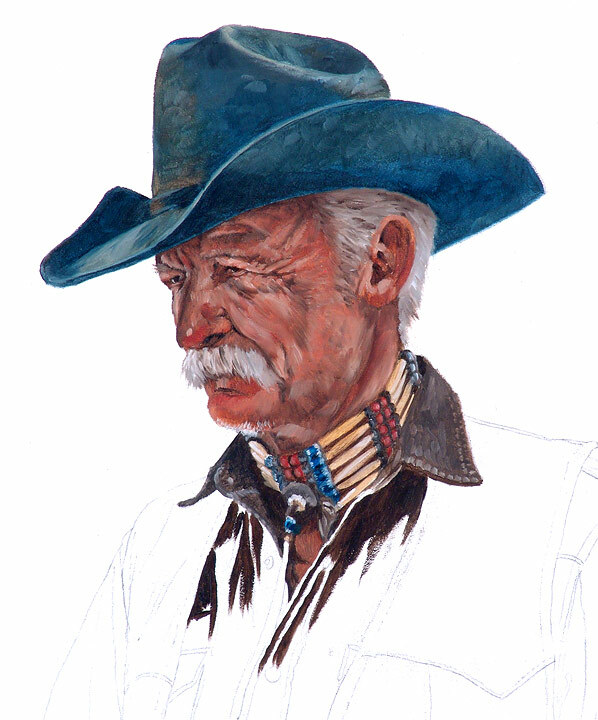 As for the question of painting Gene with dark colors, all I can say is that Gene is wearing the colors of a native Wyoming cowboy. Many, many local men dress this way. 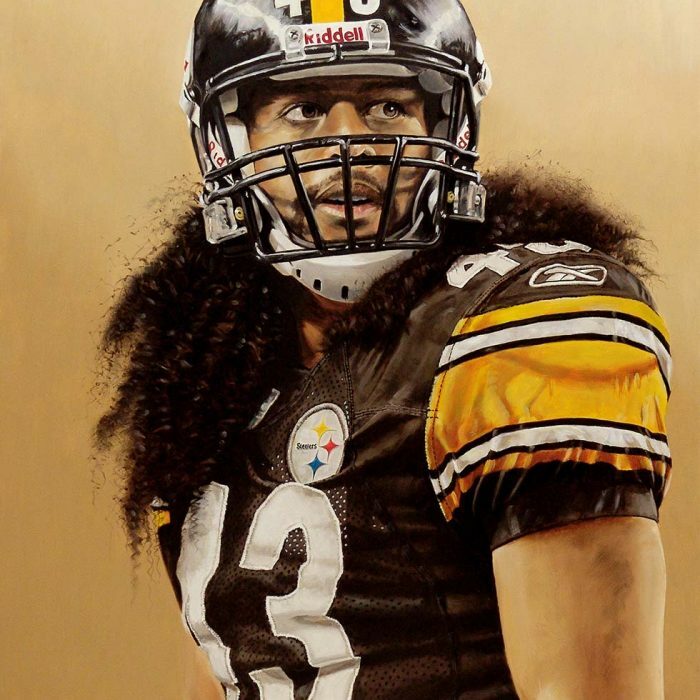 When I get an opportunity to paint someone like Gene, I usually go to their home and meet them and we go through with what they are comfortable wearing and what are some of their favorite things. We both decide how Leigh or I will photograph them and if there will be a background painted in or not. Like I said in my first post, I decided to pose Gene in the same clothes that Bama was going to paint him. I thought it was so fitting to do so. What’s good for Bama is good for me! But, back to the dark clothing, I find it more of a challenge to paint these dark colors. It is harder to get the shadows and highlights on a dark object just right. I really have to watch things like local colors that create all the colored highlights being cast. For those who don’t know what local colors are, they are usually the highlights or colors being cast from an object next to one another. For example, if a subject is wearing a red bandana, it will usually cast a red reflection on the neck skin or a shirt. In this painting of Gene, I asked him to be photographed on a very overcast day, matter of fact it was snowing. There was no hard sunlight to give me hard shadows on his face. Matter of fact, the snow on the ground actually lit his face really well. The overcast day also caused some really great local colors on the back of his left leg, his shoulders and his Stetson. Lastly, the key elements that go through my mind when I envision the end product are happening as I am posing my models while Leigh or I are shooting the photographs. But before I even show up for the shoot, I pretty much have in my head what I what. I can almost see it completed before I start the shoot. We usually shoot 75-100 shots and I will study those photographs for a couple of weeks before I start. I usually pull all of the photos that I like right off, place them in a folder in my MAC and let them cycle on my desktop for days, helping me to pick just the right one. The one that best shows the person as who and what they are is the winner. Like I said, the subject is the main thing in all my paintings, but whether the composition clicks is totally up to you and anyone that views my work. I hope that I understood all your questions and answered them correctly Jerrie. Thanks for asking these questions. Great questions BTW! It gives me a chance to answer some questions that others might want to know but were afraid to ask. My time is pretty limited as of late, but these were worth answering. Here is version five. It pretty much shows Gene finished. I like how his fancy Spanish bridle came out. All that left is to paint in the background and sign it. But first, there was one more thing to do. I usually have a title in my head before I start to paint. This time, I did not. The day Gene and Flo came over was the first time I met her. She is such a sweetheart and she was telling me as she hugged Gene that he was The Last Of The Real Cowboys! Flo had just titled the painting for me! I loved it! Since I finished this painting, Gene revealed a little more about what he was wearing. He said that he had not only had made his own saddle, he made his vest, his pistol holster, his chaps and lastly his bone necklace. If you look closely, you will see hanging from the small center metal Concho on that necklace is a strand of horsehair. Gene has owned, many, many racehorses over his lifetime. His all-time favorite racehorse eventually died a few years back. This is a small piece from his beloved horse, “Red Eagle’s,” tail. What a tribute! Here are three close-ups to show some of the details up-close and personal. Thanks for riding along. Stay tuned. There are many more of my work-in-progresses to come.